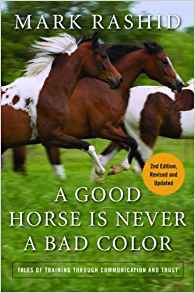 Mark Rashid, the author, uses heart-warming and humorous stories to share his techniques of teaching horses by understanding their view of the world. His tales deal with many facets of buying, owning, and training horses. Stories of Arabs, appaloosas, and paints-mistrusted and mistreated because of their breed-give a new perspective on these breeds and others. It is the truest statement I've ever heard! This book sounds SO cool! I REALLY can't wait to read it!